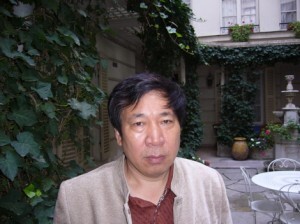 Sometimes banned and sometimes award-winning, Chinese novelist Yan Lianke is a matter of controversy in his own country. Again with his latest release “Lenin with Love” (a French translation of “The joy of living” ) his favorite, in which he plays around with the symbols of communism and consumer society, in short with the contradictions of modern China. He has just presented his book in Paris where we could meet him. Benaise is a village of crippled, created during the forced migrations of the past in Western Henan (the home province of the author). Two main characters: Mao Zhi, nearly 70 years old in 1990, she has been a very young participant to the Long March of Mao Zedong, and was appointed head of the village. The village, at the junction of three districts, lived happily, abandoned by everybody, but Mao Zhi, as a good communist, created a Maoist village of Disabled People. The “Great Leap Forward” and the “Cultural Revolution” have been very negatively experienced by Benaise inhabitants who hold Mao Zhi responsible for the drama created by outsiders,” Complete People”! After the final performance at the official opening of the mausoleum, the Benaisiens were robbed and imprisoned and for drinking and eating they have to sacrifice their last pennies and the female grand children of Mao Zhi. All this will end as a drama with the death of Mao Zhi, the accident of Liu, but finally Benaise “disjoined” will be able to live happy days. The Chinese title of the book (more suitable! ), was “The joy of living”, that of the inhabitants of Benaise when they were far away from the turmoils of history. The “Complete People” are very bad fellows: Mao Zhi, during the Long March, is raped by her platoon leader of the People’s Liberation Army, Liu has quadruplets with the daughter of Mao Zhi and disappears … But Liu is finally sentenced by the Party. IsYan Lianke along the lines of the politically correct? No, but he hardly describes the corrupt officials of major tourism projects! Mao Zhi believes in the Revolution, but her courage and honest actions are only bringing disasters. The structure of the novel is very elaborate between the present and the historical events which are often treated as comments at the end of chapters. Changes in style are a pleasure between the poetic country side in the style of Shen Congwen, the crazy funeral of Mao Zhi followed by inhabitants and dogs in tears, magic realism with her grand daughter Huaihua, dwarf, growing in size as she sleeps with “Complete People”. We will not forget the satires of historical events of the campaign for steel production which does not leave a single iron pan in the village or the Cultural Revolution when the village had to find for the statistics, a landowner, an exploiter! 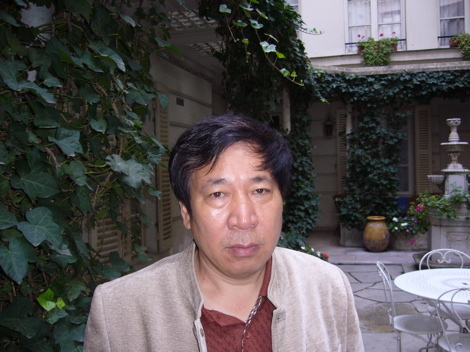 Yan Lianke has been presented already on Rue89 on the release of “The Days, the Months, the Years”, and on the occasion of an interview by Pierre Haski in Beijing during the Olympics, or his post on “The Dream of Ding village”. Q:You have not been at the Frankfurt Book Fair? Myself, I no longer work for the Union of Writers, an organization that is criticized but which has helped many writers to survive in the past with the very meager royalties paid in China. I am now a professor at Renmin University in Beijing. I notice your surprise given the image of the university (especially in the past), but I met the Vice President of the university who has a very liberal approach. However it is better that I do not talk too much to my colleagues about my new book “Elegies and Intellectuals” ( Fen Ya Song), which underlines the lack of intellectual courage of the universities of Beijing and their efforts to integrate into the system ! There are few books about intellectuals: “The Fallen Capital ” by Jia Pingwa, after being banned sixteen years, is published again, but maybe it is because Jia Pingwa is President of the Writers Union of Xian; when my own books have been banned, they remain banned ! Q: “Lenin with Love” is one of your favorite books: Why? This is one of three that I prefer. This book was not censored (contrary to what is written on the book cover!) and won the literary Lao She prize. But it is true that the military authorities’ reactions to this book have been fierce and resulted in my resignation from the army. Liu Yingque, the district chief, is only interested in his career, but I show that tightrope in politics often lead to breaking your neck, as for Mao Zhi, she is a symbolic figure of the sufferings brought by the excesses of the Revolution. Censorship forces us to deal with reality by means of symbolic or indirect means, but in this book (unlike the “Ding Village”), there is no censorship. Q: You have published a new book? A memoir that is not yet translated, and to my surprise, has been very successful (200,000 copies) as it is an easy book to read while “Lenin with Love” is considered difficult with a lot of dialect and playing with words. But in France, you’re lucky, because I am told it is very well translated by Sylvie Gentil so as “The Days, the Months, the Years” by Brigitte Guilbaud. ► “Lenin with Love”, by Yan Lianke. Translated from Chinese by Sylvie Gentil. P. Picquier 2009. 560 p., € 21.50.